In scientific modeling and simulation, one often defines multiple functions, e.g. temperature, pressure, species distributions etc. on a common domain. Understanding the relation between such functions is crucial in data exploration and analysis. 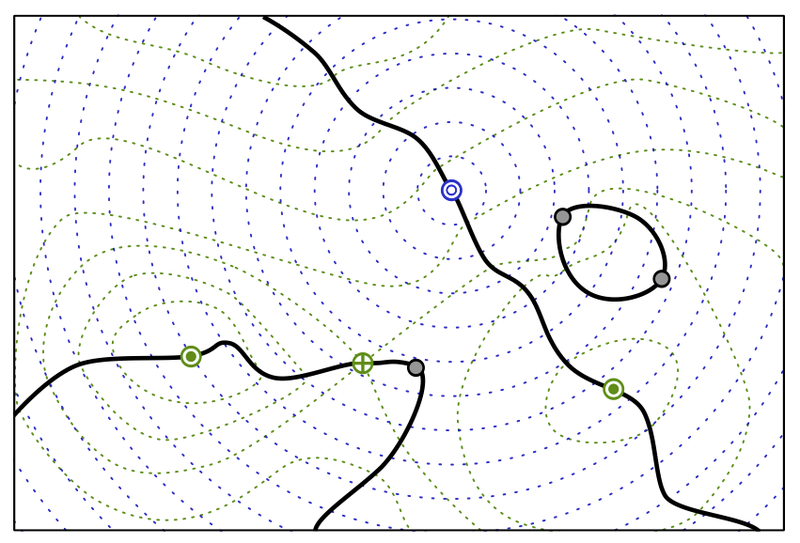 The Jacobi set of two scalar functions provides an important tool for such analysis by describing points in the domain where the two gradients are aligned, and thus partitioning the domain into regions based on relative gradient orientation. A variety of interesting physical phenomena such as the interplay between salinity and temperature of water in oceanography and the critical paths of gravitational potentials of celestial bodies (similar to the Lagrange points in astrophysics) can be modeled using Jacobi sets. In data analysis and image processing, Jacobi sets have been used to compare multiple scalar functions, as well as to express the paths of critical points overtime, silhouettes of objects , and ridges in image data . However, the Jacobi sets can be extremely detailed to the point at which their complexity impedes or even prevents a meaningful analysis. Often, one is not interested in the fine-scale details, e.g. minor silhouette components due to surface roughness, but rather in more prevalent features such as significant protrusions. The Jacobi sets are also highly sensitive to noise which further leads to undesired artifacts. Finally, the most common algorithm to compute Jacobi sets [4, 16] is designed for piecewise linear functions defined on triangulations, and is well known to introduce a large number of discretization artifacts which could skew the analysis. The natural answer to these problems is the controlled simplification of a Jacobi set by ranking and ultimately removing portions of it in order of importance. Some previous techniques exist that can be broadly classified into direct and indirect Jacobi set simpli- fication. Indirect simplification [3, 9] simplifies the underlying functions in a hope to obtain a structurally and geometrically simpler Jacobi set. However this poses several problems. First, especially in the case of two non-trivial functions, changing either of them can introduce a large number of complex changes in the Jacobi set. These changes are difficult to predict and track, and instead the Jacobi set is typically re- computed at each step, which quickly becomes costly. Second, the Jacobi set encodes the relation between two functions and therefore simplifying one function may not actually simplify the Jacobi set. For example, two functions with complex gradient flows, which are similar in terms of relative orientation, define a small and simple Jacobi set. In this case, smoothing the gradient flow of either of the functions can introduce significant additional complexity into the Jacobi set. Finally, creating an appropriate metric to rank potential simplification steps can be challenging as small changes relative to traditional function norms e.g. L2 or L∞ may induce large changes in the Jacobi set and vice versa. H. Bhatia, Bei Wang, G. Norgard, V. Pascucci, P.-T. Bremer. "Local, Smooth, and Consistent Jacobi Set Simplification," In Cornell University Library, No. arXiv:1307.7752, 2013.